And these numbers include only 1st and 2nd generation immigrants. Between 1995 and 2011 the overall population grew with 30%, the non-Western population doubled (100% growth, resulting in 20.722 non-Western migrants). There are 12.542 Western migrants. Migrants total is 33.264. Therefore, Amersfoort is becoming more and more a colourful city! But sadly, the different cultural population groups mix very slowly, or not at all. 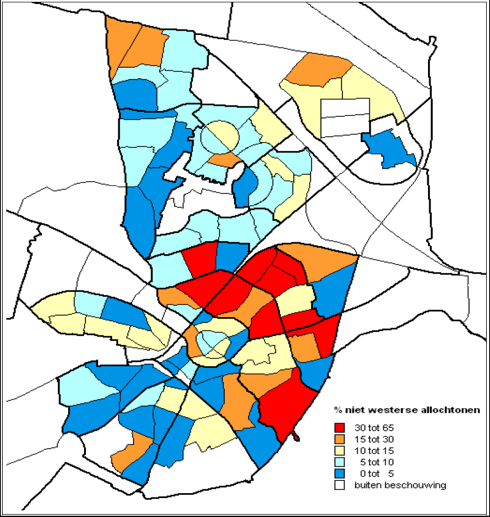 The non-western migrants are living concentrated in 4 or 5 neighbourhoods. Large groups amongst them, are non-Christians (8% of the Amersfoort population is Muslim), or Christians without a home church.